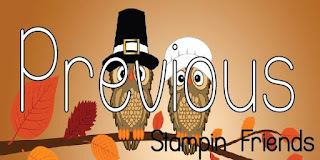 I hope you have enjoyed the Stampin' Friends blog hops we have been doing for the last couple of months! 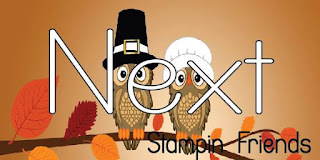 This month's theme is Thanksgiving! We hope you enjoy the cards and projects we are sharing with you and hope you come back next month to check out what we create to inspire you!!! 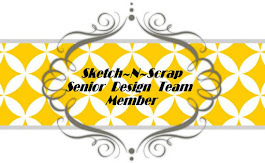 If you didn't arrive from Elizabeth Jeanne’s Blog click the Previous button to check out her amazing creations. Here’s my Thanksgiving Card. I created it using Pretty Pink Posh's Storybook 1 die for my window and Lawn Fawn Stamp sets and dies for the images and sentiment. And here is my Thanksgiving Project . It's a goodie bag that I created using Lawn Fawn's Goodie Bag die, Scripty Thanks die and used the Happy Harvest stamp set and coordinating dies. The colouring for both projects were done with my Copic markers. ATTENTION: "Do you love crafty supplies?!? If so, comment on all 12 posts in this hop and email Elizabeth everyone's favorite color to happystamper508@gmail.com. What do you get?!? In addition to enjoying all of this group's creations, you'll be entered to win a fun crafty present from every one of the bloggers! That's 12 crafty presents! Just a little thank you for your time!" Love the window die! Great scenes too. Your projects made me smile. Love the whimsical treat bag and matching card. Kids would love this! your coloring on the scarecrow is amazing!! cute, cute!! I really really really need to make an investment in Lawn Fawn! They are 100% my style and I don't own any yet! Love thanksgiving theme!great projects but trying to get my new craft room in order to start up! such a great card and gift bag! You did a fabulous job of coloring! I'm so in love with everything lawn fawn! Your shading is perfect! Thanks for sharing. Really over the top cute! Great coloring! Your card and treat bag bare the cutest! I love Lawn Fawn & Pretty Pink Posh. The card & goodie bag are so adorable. And your copic skills are magnificent. Thank you for sharing your beautiful skills. what great Thanksgiving projects! 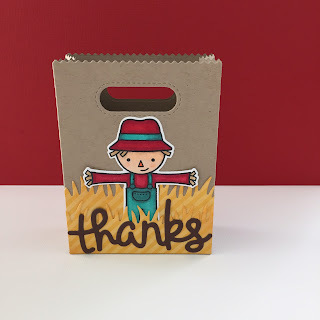 The little scarecrow is cute and your coloring is fantastic! Awesome! These are really cute!!! Brilliant little card & Gift bag!